What is the impact of the Sports Premium at Stanton in Peak? School has recently asked parents to complete questionnaires regarding their child's experience of PE in school. The questionnaires returned have been overwhelmingly positive with almost all parents stating that their child enjoyed their experiences of PE in school. What is the Impact of Sports Premium on our Pupils? The Sports Premium has enabled our pupils to engage with a wide range of sporting activities throughout the academic year. As a result our pupils have developed their physical attributes and improved engagement with physical activities showing high levels of physical literacy. What do we cover in our PE curriculum at Stanton-in-Peak? In school we already provide a variety of activities to enable children to engage with sport and exercise at their own level. We believe that children should lead a healthy lifestyle that involves regular exercise, and that sport and exercise should become a lifelong source of enjoyment. 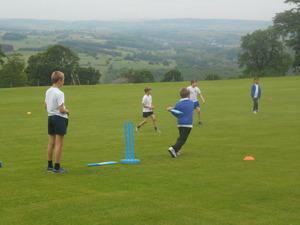 We are also continuing to develop our outdoor and adventurous activities inline with the National Curriculum. We also run sports clubs each year which have included several sports, such as: running, football, netball, ultimate frisbee, handball and core skills.